Heather Smith-Carra works with clients around the world to manage, protect, and enforce their trademarks, trade dress and copyrights. Heather focuses her practice on trademark and copyright prosecution and counseling matters. She also works on cancellation and opposition proceedings before the Trademark Trial and Appeal Board. 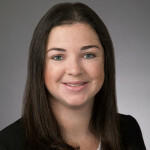 Heather has a particular interest in trademark and trade dress survey work and handling violations of the Digital Millennium Copyright Act (DMCA) to protect client’s online presence. She previously worked as a research intern for the IP video game blog PatentArcade.com, where she researched, analyzed, and summarized intellectual property litigations focusing on patent, trademark, and copyright law. In addition, she previously held multiple roles at the firm including patent and trademark prosecution paralegal and trademark law clerk. She is a member of the Intellectual Property Division of the American Bar Association, INTA, and AIPLA. While attending law school, she served as a student mentor and Student Editor for the ABA-IPL’s Landslide Magazine. Heather earned a B.A. in international studies from American University and her Juris Doctor from The George Washington University Law School. Heather practices in the Washington, D.C. office of Banner & Witcoff, Ltd.